On the last day of the Islay walking week 2013 we went on a long anticipated excursion to neighbouring Jura: In the 11th year of Walk Islay we were finally going to conquer one of the Paps of Jura, Beinn a’Chaolais (733m). These are some of the walkers (20 made it to the top) at the summit in perfect weather. In the background Beinn an Oir (left, 785m) and Beinn Shiantaidh (right, 757m). 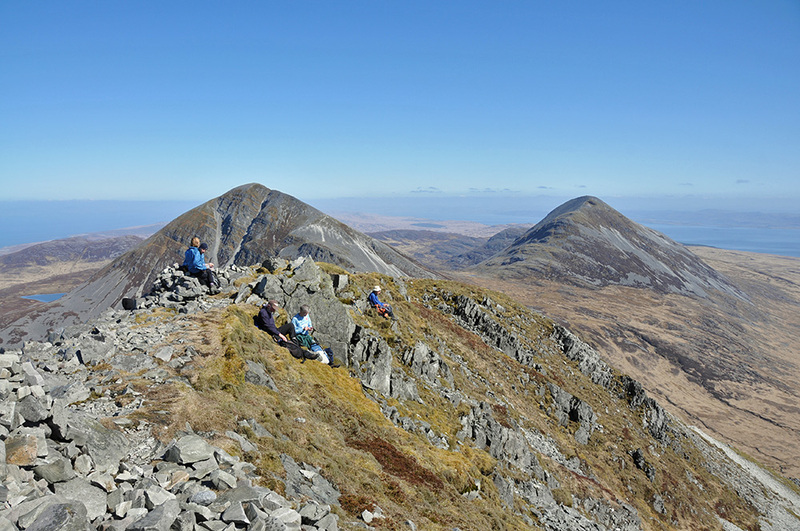 This entry was posted in Jura Excursion, Landscape, New Post, Sunny Weather and tagged Beinn a'Chaolais, Beinn an Oir, Beinn Shiantaidh, Jura, Paps of Jura by Armin Grewe. Bookmark the permalink.